Advanced Teeth Whitening: Dr. Spaeth offers a safe, effective system called Opalescence that can brighten stained, discolored or dull teeth in the comfort of your own home. Choose from mint and melon flavors! Zoom™ whitening also available for in-office one hour results. Natural-looking Crowns and Bridges: Dr. Spaeth will help determine the type of crowns and bridges that will best suit your needs for strength, health and incredibly natural-looking results. Dentures can be complete or partial. Complete dentures cover your entire upper or lower jaw. Partials replace one or a few teeth. Advances in dentistry have made many improvements in dentures to be more natural looking and comfortable. 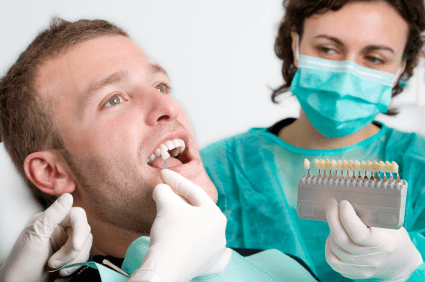 Tooth Colored Fillings: Composite fillings bond to the tooth to restore most of the original strength of the tooth, while restoring the natural appearance of the tooth. Composites require less removal of tooth structure than amalgam fillings, and are mercury-free. Dental Implant Restorations: Dental implants are like a second chance at having natural teeth. We provide you with reliable, permanent implant restorations. Single-Visit Root Canals: It sounds hard to believe, but in most cases we can perform root canals in just one visit. That means you’ll only have to come back to get your permanent crown placed. Nonsurgical Gum Care: State-of-the-art treatment helps ensure the health of your gums and the life of your teeth. We offer a full range of gentle nonsurgical gum treatments customized to your specific needs. Dental Veneers are custom-designed shells of tooth-like ceramic material that, when applied over the surface of a tooth, can cover worn tooth enamel, uneven tooth alignment or spacing and chips or cracks. The translucent ceramic quality of today’s veneers provides a natural look that creates a bright, white smile with beautifully aligned, shapely teeth.